Following an investment of some $280 million in the rehabilitation of 283 miles of Ecuador’s railway system, the luxury Tren Crucero was launched in June, 2014. The 5, 12 and 13-day adventures are an experience for all the senses, bringing guests into close contact with the people and landscapes of the Andes and the Coastal regions, while riding in comfort aboard custom-designed carriages – with some sections using restored, 20th century steam locomotives. The Tren Crucero travels from Quito to Guayaquil on the coast, or vice versa, over four days with overnights in traditional country inns. 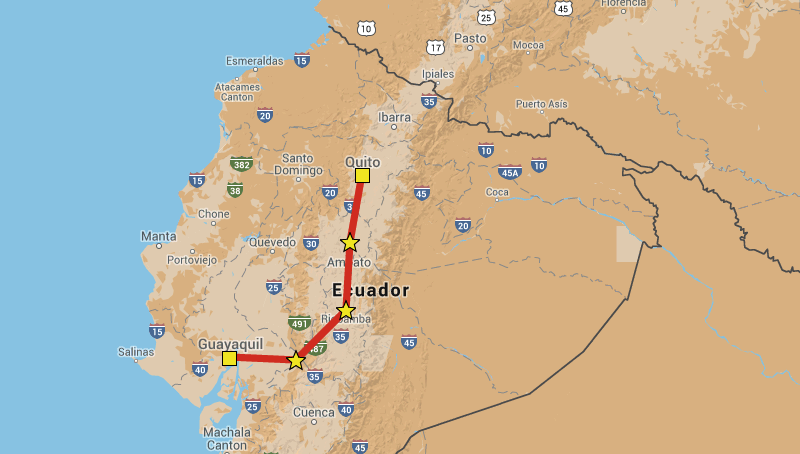 The route includes the dramatic 'Devil's Nose' segment, connecting the Andes and the Coast, the main reason the Ecuadorian system is regarded as 'the most difficult railway in the world'. The four thematically styled carriages carry 54 guests through different, fascinating regions and peoples. Two of the four carriages are furnished with tables and chairs where guests can enjoy a light aperitif, read a book or simply enjoy the scenery rolling past the large picture windows. One of these coaches is equipped with personal lockers for storage, while a third offers a coffee bar where the crew serves beverages and snacks including Ecuadorian favorites. The last carriage comprises two sections: the first with a lounge area for socializing and the second with an open terrace where guests can travel amid the elements, as the train wends its way through Ecuador's majestic landscapes. All of the trips include: the train ride; overnights in selected hotels or haciendas; meals with Ecuadorian dishes in each region; guided excursions to the main natural and cultural attractions; bilingual English/Spanish guides; and excursions aboard a tourist bus. •One Night at the Wyndham Hotel, Guayaquil after your train trip. •One Night at the Swissotel, Quito before your train trip. and Peru (Vista Dome) and the all NEW Belmond Andean Explorer. Experience the best luxury trains in South America in one trip - The Great South American Luxury Train. Experience	Travel on the Tren Crucero in Ecuador. 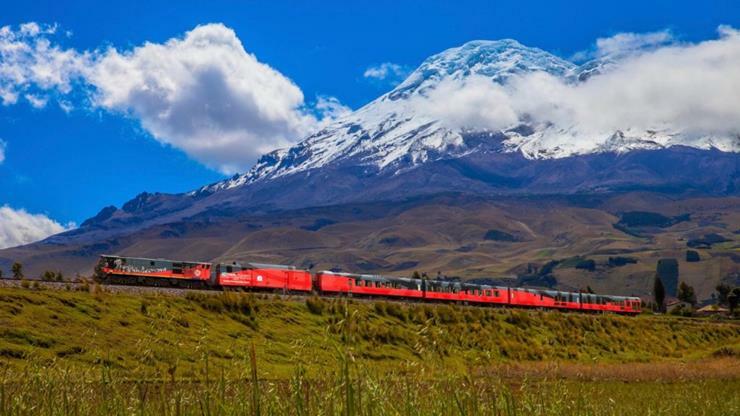 Voted the best train in South America from Quito to Guayaquil,	and travel to Lima, Cusco and Machu Picchu. •One Night at the Wyndham Hotel, Guayaquil before your train trip.